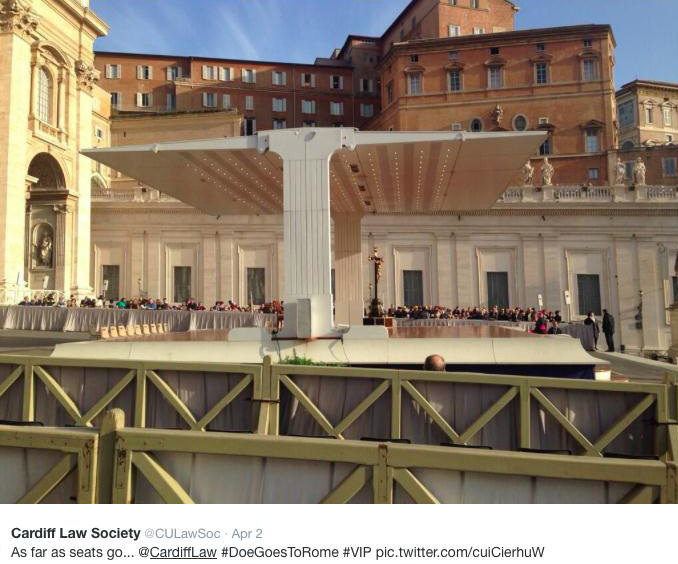 On March 31st, those of us taking the Undergraduate LLB module ‘Law and Religion’ flew to Rome for an educational visit. 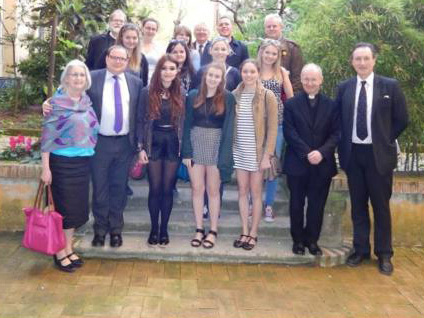 We were joined by students from the Cardiff Law School Centre for Law and Religion LLM in Canon Law and eight Ordinands from St. Stephens House, Oxford. 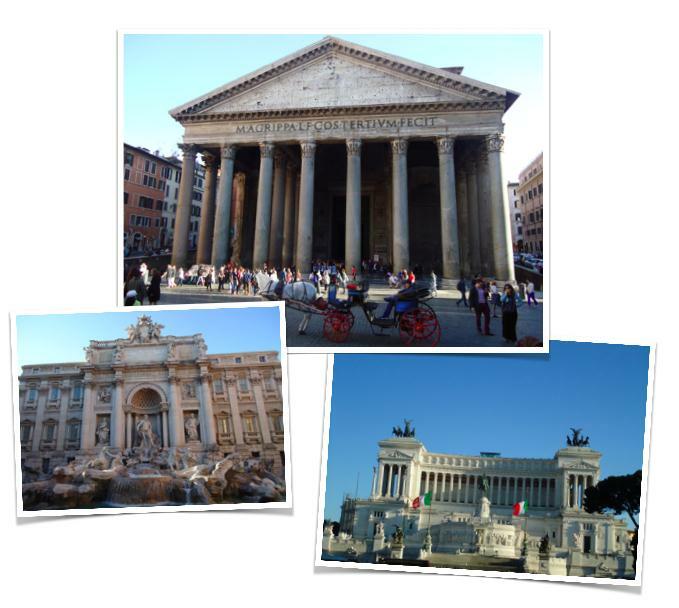 We saw the Colosseum, Pantheon, Trevi Fountain, Spanish Steps and Altare della Patria before retiring for pizza and prosecco in the Piazza Navona! We loved the café quarter atmosphere and thoroughly enjoyed music from an acoustic guitarist in the square, who played everything from the Red Hot Chili Peppers to Bruno Mars to Pink Floyd! On Tuesday morning, we met beneath the statue of Bruno in the Campo de’ Fiori – the sun was shining and a few of the group bought souvenirs from the bustling market before our visit to the Supreme Tribunal. 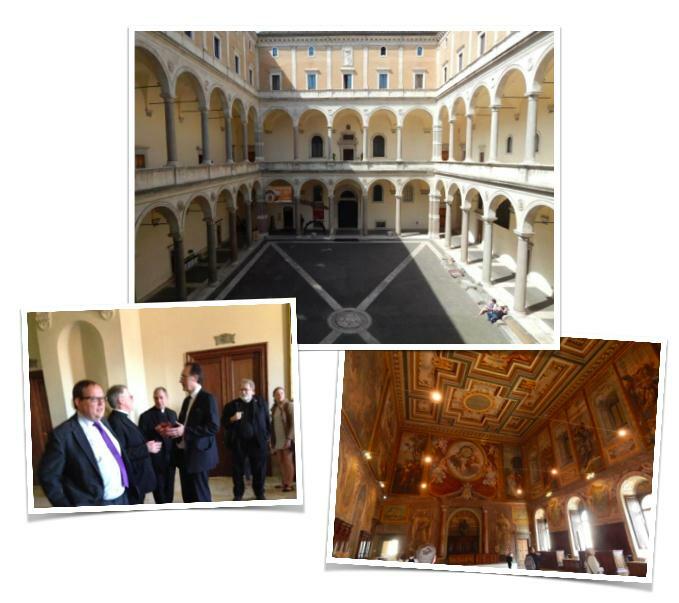 By 9.30 am, we arrived at the Palazzo della Cancelleria – the offices of the Supreme Tribunal of the Catholic Church. We were greeted by Monsignor Gerard McKay, an auditor at the Rota, who welcomed us and took us on a short tour of the magnificent building before our talk. 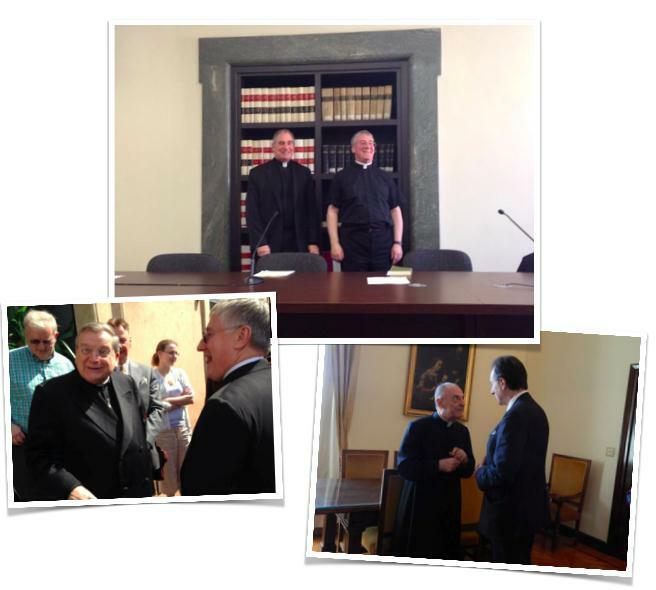 Once seated in one of the courtrooms, we were welcomed by Archbishop Daneels, Secretary of the Apostolic Signatura. Monsignor Punderson, also a member of the Apostolic Signatura, delivered a paper, followed by Monsignor Gerard McKay (an auditor / judge of the Rota). The trio spoke about the tribunals of the church, the supreme court, the Vatican curia and the Catholic Code of Canon Law 1983. We found the talks extremely interesting, particularly engaging with Monsignor McKay’s talk on marriage cases that come before the court, as we were able to relate this to our work on the topic of Religion, Marriage and Children in our LLB module. We asked some tough questions before Monsignor McKay took us to meet the Dean of the Rota: His Excellency Monsignor Pio Pinto. At lunch we were joined by the Cardinal Prefect of the Supreme of the Apostolic Signatura, Cardinal Burke (equivalent to the President of the Conseil d’Etat of France) in the Piazza Navona. After our fabulous lunch at Ristorante Tucci (their spaghetti alle vongole is amazing), we headed to the Venerabile Collegio Inglese, for our seminar. We were joined by those from St Stephen’s House Oxford and Roman Catholic ordinands training for the priesthood at the English College. Mark Hill QC (Ecumenical Fellow in Canon Law at the College, and Honorary Professor at Cardiff Law School) and Professor Norman Doe led the seminar. Norman and Mark started off a number of debates on the short presentations from those on the LLB module, relating to the governance of the Catholic Church and Italian religion law. We learnt a lot from the Roman Catholic ordinands about the importance of the Documents of Vatican II – references to these will now no doubt appear in our exam answers! We then enjoyed a short presentation by Norman and Mark on the work of the Colloquium of Anglican and Roman Catholic Canon Lawyers and on the work of the Symposium on Christian Law held in Rome in November 2013. On Tuesday evening, we met up at Ristorante L’Orso ‘80 for a fantastic group dinner – we’ve never seen or eaten so much antipasto! 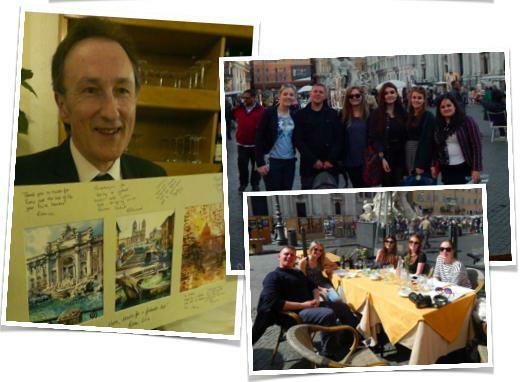 We also surprised Norman with a thank you gift for organizing such a brilliant trip before heading back to the Campo de’ Fiori. We met bright and early at the top of Via della Conciliazione (the road leading up to the Vatican) before heading into St Peter’s Square to find our seats for the Papal Audience! Monsignor Gerard McKay got us special tickets and as you’ll no doubt have seen from the tweet on @CULawSoc, we had some of the best seats in the house – thank you Monsignor McKay. The scenery in St. Peter’s Square was truly spectacular, so it’s only fitting to end this short blog with some more pictures. On behalf of all students who embarked on the memorable and impressive trip to the Eternal City, I’d like to thank Cardiff Law School, Professor Norman Doe and Mark Hill QC for organizing and making possible a trip that we’ll never forget.